As soon as we climbed out of bed, Robby went to open the kids doors-which was their sign that it was okay to get out of bed (since they didn’t have a clock in their room). By the time he had walked back into our bedroom, everyone was filing in behind him. I think that they were a tad bit excited about starting their Disney day. After the kids had on their clothes, they ran downstairs and Nonna and Pops helped fix their breakfasts. I do believe that my boys had Big Texas cinnamon rolls, Campbell and Keaton had pop tarts, Reagan had cereal and Whitman ate mostly strawberries for breakfast. Before 8 we were loaded up ready to go. We looked back on the blog from 2 years ago to determine what we hauled into the park each day. Since we could find it I will make sure that I document it this year. Into the park each day we are bringing one backpack that is all diaper bag stuff: cups, diapers, clothes for all, wipes, candy. Then we have another diaper bag that is full of Disney pins, autograph books, food for lunch and snacks. Also on the back of the second stroller, we have an ice chest that contained our lunches (lunchables, sandwiches, roll ups) and drinks. Because this is Saturday, we opted to not go to Magic Kingdom this morning which would have been my first choice for the initial park to go to but we were afraid of the Saturday crowds. Animal Kingdom was the park that worked best on our schedule so that is where we headed. We parked nearby (grieving the loss of our AAA crazy close parking) and then walked to the front of the park. The park was opened a bit early so we headed to the Triceratops ride. Everyone was able to ride that ride and we jumped into the line. The kids loved it-Whitman especially. He was pretty excited when we told him that we were going to ride that one again. Poor Graham was so looking forward to riding the spinning ride nearby. He was too short last time we were here but today the ride was closed for repairs. I felt pretty bad for him but I guess that is a pretty good reason for us to come back for another trip. Just a short walk away was the Dinosaur ride. We convinced Keaton and Campbell to go on it twice with us. Whitman hung out with Nonna and Pops the first ride and then with Robby the second ride and that is when we convinced Pops and Nonna to ride with us. If I recall correctly, Pops said that he thought he was going to throw up on that ride. The next item on the agenda was the Bug Life show. We sat right up front and it was pretty fun for everyone...except for Whitman. He kept telling me “I no like dis show.” The poor thing would have crawled behind me if he could have but once the happy music near the end started he perked up again and started enjoying it. We jumped in line to see Mickey and Minnie. Last time we came here, Whitman and Keaton were the ones timid of the characters and we just assumed that Whitman would be this time. As soon as he saw Mickey and Minnie he started talking to them. He jabbered and jabbered about his Mickey shirt and about who knows what else. It was the cutest thing ever and he even kissed Minnie Mouse. The rest of the kids were just as enamored by the characters. I guess most everyone realized that they are just people dressed up now and that makes me a little bit said but as long as everyone still wants their pictures with Mickey, well that makes me happy. 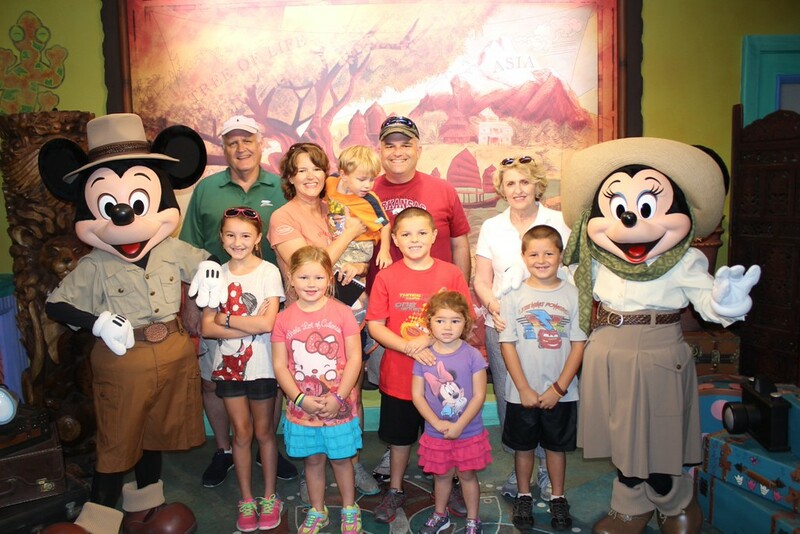 All of the grownups happily took their pictures with Mickey today too. After this, it was time for us to set down and have a snack for a few minutes. Robby then took everyone except Whitman to ride the Haki rapids. Whitman, Nonna, Pops and I hung out at the table while they were gone. The wait time on their rapids said 30 minutes but within minutes at all, Robby was writing saying that they were already on the ride. Then he wrote again and said the ride was stopped. I think they were stopped on the ride for about 10 minutes. Reagan said that the people that were on the ride with them didn’t speak English-that might have made for a long ride! Close by that ride was Mt. Everest and the 4 big kids, Robby and I all rode that ride. It is a pretty good roller coaster-probably a favorite of mine and when it is over, the people on it even clapped. Reagan, Anderson and Graham went in the single rider line the 2nd time and moved much quicker than we did in the fastpass line so we told them to go again and then we would wait on them. Then we stopped for lunch and ate our picnic lunch. The kids all devoured their lunches and we did too-I guess that a morning at the park makes you hungry. After cooling off with our lunches and cold drinks, we headed for one last morning adventure. We had passes for the safari and rode on it. It was fun and Campbell was all about spotting the animals. The animals were out and we saw many giraffes but we weren’t able to feed them like we had the other day. My favorite animals to see today were the hippos all submerged in the water. But really, my eyes were getting pretty heavy during that safari-I think that is usually where I get a bit tired! So if you go to Africa for a real safai, you probably don’t want to take me-I might just sleep through it. Then it was time to head back to the house. I am sure that it is a bit strange to see people leaving the park around 1:30 (though we are not the only people doing that.) We went back to the house and the kids threw on their bathing suits and jumped into the pool. Pops sat outside and watched them-or quite probably he was sound asleep! Robby was inside napping and Whitman was doing the same. Nonna was working on her laundry and I was the designated kid watching-while I worked on my blog! The kids swam and swam until it was almost super time. We had lasagna and bread in the oven and while that was cooking we made chicken spaghetti for tomorrow or the next night. After changing we all set around the table and gobbled up our food. Then we cleaned up the kitchen and headed to Epcot. Today was the first day or the first weekend of the food and wine festival and it was very, very crowded. We had hoped to sample a few foods but there was no way that was going to happen tonight. But we did find that Nemo had a short ride and hopped in that line. We waited for a while without moving and then the lights popped on and the line really started moving. We thought that maybe, just maybe, they were just doing the line with the lights on but no, the ride had stopped and we were all walking out of the line. We did receive a fastpass for another ride. We did take the obligatory shark picture before going into the next room to talk with Crush. Crush talked specifically to Reagan and then to me. He also asked if anyone had any questions and Campbell’s hand shot up and she was called on. And then she had nothing to say (that really never happens) but Graham, Anderson and Reagan were all heard whispering questions for her to ask in her ear. She finally heard one and asked Crush her question. For some reason Whitman decided that he did not like that show either and even said “get me out of this room.” Poor baby! After Crush, we walked around some but the silly crowds caused us to just decided to go and ride the ball and head back to the house. Heading back to the house might have had something to do with the Razorbacks playing on tv as well. Robby debated riding the monorail around some a bit tonight but we will save that for another night. The kids were fine with that plan since they were able to trade a pin as we walked towards the exit. Then we went around the ball for the Spaceship Earth ride. Whitman thinks that he has to ride with me on every ride so we were on this ride together and the Spaceship Earth is Whitman’s kind of ride. He was as happy as he could be on it and at one time I even thought that he was going to go to sleep. I have had kiddos fall asleep on that little ride before and I was not going to be surprised if Whitman did this time. He didn’t and everyone was awake for the tram ride back to the car. It was the longest tram ride ever but the weather was absolutely perfect so none of us seemed to mind. Once in the car, it wasn’t long until we were back at the house. Robby pulled out the ice cream and turned on the hog game. The funniest part of my evening happened when the kids were putting on their pajamas in my bedroom. Campbell was already upset and was trying to walk out of the room. She first walked into my closet and started saying “how do you get out of here? how do you get out of here?” and then she turned to find the door and walked towards the wall beside my bed. By this point, she was frantic and shouting “how do you get out of here?” I couldn’t help because I was laying on the floor laughing at my precious child! Right now the kids are in bed, the dishes are washing, the tv is on and laundry is in the dryer-pretty much like a night at home. I think we did pretty good today for our first Disney day. Our usual schedule is arriving when the parks open, staying until around 2 and then going home for naps/swim and then heading back to the parks after supper. Of course that is the usual schedule (our last day last time here we hit all 4 parks) and as I am writing about all of that Robby asked about changing things up a bit for tomorrow so we will see just what happens!